Jose Arana Jr at Fraser Yachts in Fort Lauderdale sends word that, following a full refit, his central listing, the 30.48m motor yacht Mi Cielo, is back on the market. 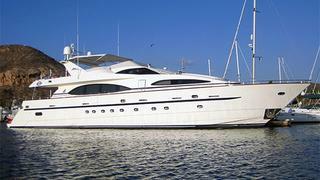 Mi Cielo was delivered by Azimut in 2006. Her lavish François Zuretti interior sleeps eight guests in a master, VIP and two twin cabins and this superyacht’s two 1800hp MTU engines power her to a cruising speed of 22 knots and a maximum speed of 25 knots. Her 2011/2012 refit saw her engines and generators rebuilt and a new air conditioning system installed. Lying in Fort Lauderdale, Mi Cielo is asking $2.25 million.